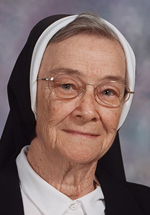 Sister Trinita Balbach, O.S.F., 91, died in Assisi House, Aston, on March 13. She had been a professed member of the Sisters of St. Francis of Philadelphia for 70 years. Sister Trinita (Helen Marie Balbach) was born in Wilmington, Del., where she was a member of St. Thomas Parish and a graduate of Wilmington High School. She entered the congregation in 1943 and professed her first vows in 1946. Her sister, Sister Helena Joseph Balbach, also entered the congregation and currently lives in Wilmington. Sister Trinita earned a B.S. in education from Mount St. Mary’s University in Emmitsburg, Md., and a M.A. in educational administration from Loyola College in Baltimore. She ministered primarily in education as both teacher and principal and, in later years, in parish ministry. She ministered for many years in various parts of Florida, in particular spending 27 years in the Diocese of Venice. She began at St. Ann School in Naples where she served first as teacher and later as principal. In 1993 she returned to Naples and worked at St. Peter Parish, serving as coordinator the parish’s ministry to the sick and homebound. In 1998 she also began working as assistant director and school adviser with the George and Mary Kramer Foundation which provided financial help for students in Catholic schools. Sister Trinita also ministered for 19 years in the Diocese of Orlando, 13 years in the Archdiocese of Baltimore and four years in the Diocese of Charleston, all primarily in education. In 2011 Sister Trinita moved to Our Lady of Angels Convent, the congregation’s motherhouse in Aston, where she volunteered in the congregation’s foundation office. In 2012 she moved to Assisi House where she served in prayer ministry until her death. The funeral Mass was celebrated March 18, with burial following in Our Lady of Angels Cemetery in Aston. Sister Trinita is survived by her sisters, Frances Balbach and Sister Helena Joseph Balbach, S.S.J., by her nieces and nephews, and by her Franciscan family. Donations in her name can be made to the Sisters of St. Francis Foundation, 609 S. Convent Road, Aston, PA 19014.